PADUCAH, Ky. - No one was more surprised than I when I started to cry in the main gallery at the National Quilt Museum. Partly I was overcome by the sheer beauty of the huge collection of award-winning contemporary fabric masterpieces. But I'm guessing most of my tears were for my mom, who can no longer travel or sew and piece together her own works of art. Like many of her fellow quilters in Florida, Mom had been to Paducah (pronounced puh-DOO-cah) because it is a mecca to them. The museum sees a steady flow of visitors daily, and every year, more than 25,000 quilters nearly double the size of the city for a four-day show and conference put on by the American Quilter's Society, which is based here. We were in western Kentucky when I saw that we would be driving past Paducah. I thought I would stop by the museum for Mom's sake. I wasn't expecting much from the city itself, based on her recollections from the early 1990s. But what I discovered while planning the quick stop, which grew into a two-day stay, was that quilting now shares the stage with many forms of art. More than that, Paducah, a historic Civil War town at the confluence of the Ohio and Tennessee rivers, has transformed itself in a way many small cities would envy. Most of the credit goes to its Artist Relocation Program, which has turned Lowertown, the most rundown section of Paducah, into a crown jewel. Although various residents had worked to save the area, the turnaround came in 2001 after Mark Barone, a local artist, and Thomas Barnett, the city planner, created a program offering artists affordable real estate, financial incentives, relaxed zoning laws, and marketing support. Artists invested much of their own money and labor to improve the neighborhood, now called the Lowertown Arts District. The results are amazing. Crime has been reduced, houses restored, and galleries now dot the 26-square-block area. Although you might suppose fabric art would predominate, the work is pretty much across the board, including painting, multimedia, photography, metal and glass sculpture, ceramics, and jewelry. There is one large textile gallery, Bryerpatch Studio, run by Caryl Bryer Fallert, an international quilting star who moved from the Chicago area in 2005. The first artist to move here from out of state was Bill Renzulli, a painter and printmaker who arrived in 2001 from Maryland with his wife, Patience, a writer. They are among a handful of artists to offer guest accommodations in their homes. My husband and I were given the keys to their house and had an upstairs wing almost to ourselves. The best part was that we got to stay in the heart of Lowertown. The mostly residential area is not only convenient to galleries and cafes, but also is filled with beautiful historic homes and new homes built in old styles that are going up on empty lots. When the Renzullis bought their 19th-century home from a private owner, it was all but gutted, said Bill Renzulli, a retired physician and longtime artist. They restored and renovated the structure and added a wing for a studio and small retail space, called Gallery 5. "There's one thing all of us here always cite: community," Renzulli said. "People will come here to check it out and then put their house on the market the same day." When we were in town on July Fourth weekend, Renzulli's niece was planning a move from Baltimore; another artist's sister and brother-in-law had just relocated from Hattiesburg, Miss., and their artist daughter and son-in-law were talking about moving from North Carolina. So far about 70 artists have moved here, and more than half have public spaces. Renzulli calls the program and its setting "the perfect storm." "There's an energized community, a delightful downtown, and Lowertown is a well-defined area adjacent to it." Still, he said, it's not a place to rest on your palette, and indeed, some artists, galleries, and restaurants have already come and gone. There isn't a large base of local shoppers, and there is some town-gown conflict among residents. "You have to come here primarily because it's where you want to live and work," he said. "My sales have gone up every year, but you have to promote your art just like you do anywhere." It was a neighborhood gathering at the Renzullis' that prompted Aynex Mercado, a quilter and graphic designer, to move south from Greenfield, Mass., three years ago. Mercado discovered quilting a decade ago while going through rehabilitation after being in a serious car accident while she was a student at the University of Massachusetts at Amherst. The accident left her with limited use of her right arm and hand, so that she had to learn to be left-handed, making her contemporary quilts all the more remarkable. "I saw an article about the relocation program and decided to come here just to have a look," Mercado said. "There was a potluck at Bill's, and everyone was just so nice, like we'd been friends for 20 years." Nancy Calcutt, a painter who grew up in Sturbridge, Mass., moved here from Mississippi with her husband, Charlie Doherty, a singer-songwriter. For a while, Calcutt and Doherty formed a band with another Paducah couple, calling themselves the Relocators. They are still working on the 1925 house they purchased in 2003. They've built an attached studio and gallery for Calcutt's figurative oil paintings and pastel drawings. Calcutt, who taught art at the college level for many years, is involved with the opening this year of the Paducah School for the Arts, part of West Kentucky Community and Technical College. After feeling not quite at home in other places, she said, "I do feel like we belong here." Not to say that all was perfect. During our stay, we walked or drove to a dozen galleries and studios and the museum, whose formal name is the Museum of the American Quilter's Society or MAQS. (There's a free trolley service, too.) Not every shop was top-notch or contemporary, but none was intimidating. And while we liked the downtown Market House Square area near the river, which bustled with shops and restaurants, we wished that the main streets through town had fewer empty storefronts. Our biggest disappointment was that the mighty Ohio just beyond the square was hidden behind a tall, two-block-long flood wall. When you consider the flood damage over the years (especially in 1937), it's understandable. 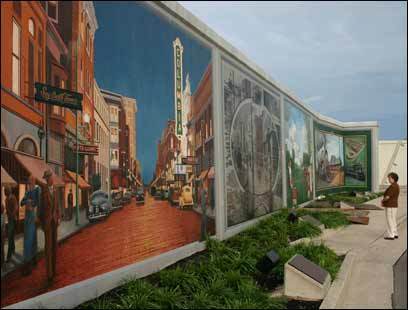 The loss of a water view is partially mitigated by the 50 gorgeous murals covering the wall by artist Robert Dafford that depict Paducah's colorful history. And a waterfront development project is in the works. But this I know for sure: Mom would have been impressed with what Paducah has pieced together, artist by artist. Diane Daniel, a freelance writer in North Carolina, can be reached at diane@bydianedaniel.com. Rooms are generally $50 a night. California-Italian cuisine with fresh fish and homemade pasta, $11.95-$21.95. Local favorite for breakfast and lunch in the heart of the arts district, $2.99-$6.49. Splendid breads, sweets, and sandwiches in a business revived by family's fifth generation, $3.50-$6. Artsy decor as creative as sandwich menu $4.95-$7.75. Adults $8, seniors and students $6, children under age 12 free. A 26-square-block area from Jefferson Street to Park Avenue and Third to Ninth streets. Many galleries have set public hours. Maps online and at most galleries. Second Saturdays: Galleries open to the public from 1-9 p.m. The Lowertown quilt walk is every April, in conjunction with the American Quilter's Society annual quilt show.